When was Bread invented? Bread has been a staple food in mankind’s diet for thousands of years, providing the carbohydrates needed for a healthy, energetic lifestyle. Historians tend to agree that bread was invented in Prehistoric Egypt c. 8000 BC when the first grinding stone, called a quern, was invented by the Ancient Egyptians, and the first grain, a specific variety of wheat called emmer, was crushed and made into bread. Who invented Bread? The name of a specific person has never been credited with the invention of Bread. The invention of Bread is so old that the name of the inventor has been lost over time, although there is enough evidence to believe that this important food staple originated in Ancient Egypt. Definition of Bread: Bread is defined as a food made from dough of flour or meal and usually raised with yeast or baking powder and made from flour or meal by moistening, kneading, and baking. Unleavened bread is a flatbread whereas leavened bread contains rising agents such as yeast or or baking soda that cause the dough to rise creating a light, airy product. Fact 1: Who invented Bread? The name of the inventor of Bread is unknown but it is believed to have been invented c. 8000 BC by the Ancient Egyptians. Fact 2: Who invented Bread? Prior to the invention of the first grinding stone to make bread c. 8000 BC, Prehistoric man had already been making gruel from water and grains. In the winter they began to heat the mixture on stones and found that it became a solid form that would last for several days. Fact 3: Who invented Bread? The Ancient Egyptians invented the quern stone c8000 to grind their grain, emmer wheat, to make flour for bread-making. The quern was a sloping stone with a bowl at the lower end for collecting the flour. The grain was painstakingly crushed into flour by rubbing another stone up and down the quern. Fact 4: Who invented Bread? The Ancient Egyptian bread was made with just flour and water. The dough was kneaded and made into flat pancakes, similar to pitta breads, that were cooked on a shelf over a fire. Fact 5: Who invented Bread? As time passed other ingredients were added to the dough. Dried fruits or honey was used to sweeten the dough and herbs and spices were added to provide different flavors. Oil or milk was also used to enrich the bread and different shapes were made for special occasions. Fact 6: Who invented Bread? The invention of the Baker's Oven, called an 'ourin', was made c. 4000 BC and provided the Babylonians of Mesopotamia with important supplies of flatbreads to feed the growing population of their cities and provide a store of food. Fact 8: Who invented Bread? The invention of Bread began with flatbreads, known as unleavened bread. Leavened bread contains yeast and produces a light, airy bread. Fact 9: Who invented Bread? The invention of leavened breads, those containing yeast, are once again credited to the Ancient Egyptians c300BC. The effect of adding the rising agent was probably discovered by accident when some yeast spores, drifted onto a dough that had been put to one side before baking. The dough would rise to make the bread lighter and more appetizing than usual. Sourdough is the oldest and most original form of leavened bread. Fact 10: Who invented Bread? The terms leavened and unleavened bread often appear in the Bible and have religious symbolism. Risen breads puffed up with leaven is reminiscent of sinful pride whereas unleavened (matzo) bread symbolizes that which is humble, simple, and pure. Fact 11: Who invented Bread? A Bakers' Guild, The Collegium Pistorum, was formed in Rome c.168 B.C. Wealthy Romans preferred white breads to the darker variety (whole grain) especially the rich white breads that were made with milk, eggs and butter. Fact 12: Who invented Bread? The crusaders developed a hard, twice baked bread, similar to a hard biscuit, that could be kept longer than other breads. The crusaders brought back their twice baked breads to Europe and these were eaten in monasteries and used for provisioning ships (Hardtack), or towns threatened with a siege. Fact 13: Who invented Bread? Early evidence of the first water-driven wheel, the Watermill, with machinery driven by water that milled flour, dates back to c300BC. The watermill was adopted in Europe and in England, after the Norman Conquest, the Domesday Book lists around 6,000 water-powered flour mills in England in 1086. Fact 14: Who invented Bread? The first recorded windmill design, known as the panemone, originated in Persia c900 AD. It was originally used for pumping water then it was adapted for grinding grain. The concept of the windmill was brought to Europe c. 1270AD during the Crusades. Fact 15: Who invented Bread? The preference for white breads by the wealthy, nobility and royalty was continued in Europe during the Middle Ages. The fine white bread eaten by the rich was called Manchet which was prized as a status symbol. Fact 16: Who invented Bread? The brown, black or gray breads made with barley, rye, oats, or millet was always ranked as coarse food which were eaten by the poor. Bread trenchers were common and consisted of thick slice of dry, stale wholemeal and used as a kind of ‘edible’ plate! Fact 16: Who invented Bread? The Middle Ages in Europe was dominated by the feudal system and during this time the Lord of the Manor had the right of common oven that required serfs to pay the customary charge to make use of the watermill or windmill and the oven for baking bread. Fact 17: Who invented Bread? The number of deaths due to the Black destroyed the feudal system forever and the life of the men who were once serfs changed dramatically. No longer tied to the Lord of the Manor and his lands men started their own businesses and developed skills to become tradesmen. Medieval guilds attempted to guarantee standards amongst tradesman but some disreputable millers and bakers had a reputation for short-weighting their bread. Fact 18: Who invented Bread? Strict laws were passed, regulating the weight of various kinds of breads, however bakers found it impossible to make their loaves absolutely uniform in weight. As a result bakers developed the practice of giving thirteen loaves on every order for twelve loaves, thereby guaranteeing that there would be no penalty for short-weighting. This practice is still remembered today via the well known term "A baker's dozen". Fact 19: Who invented Bread? 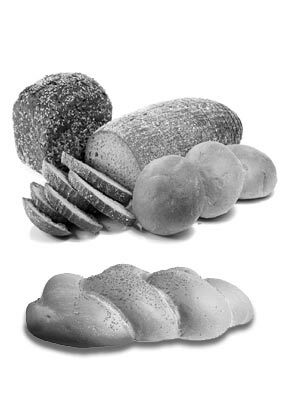 The Industrial Revolution witnessed massive improvements to the bread making process. The invention of the steam engine by James Watt in 1769 was a great success and sold to various industries including flour mills. John Montagu invented the sandwich in 1762. Fact 20: Who invented Bread? The old watermills and windmills began to be abandoned when a Swiss engineer called Jacob Sulzberger invented the Roller grain mill that producing a uniformly white flour without bran. By 1800, 75% of the watermills and windmills had disappeared. Fact 21: Who invented Bread? Automatic machinery was invented to mass-produce cheap breads including machines to knead the dough, for mass baking and for wrapping bread. Fact 22: Who invented Bread? For the very first time in history, whiter flour, and therefore white bread, was produced at a price that everyone, not just the rich but also the poor, could afford. Fact 23: Who invented Bread? The early 1900's public demand for labor-saving electrical appliances in the home increased and in 1909 the first commercially successful electric toaster was launched by General Electric and in 1928 Otto Frederick Rohwedder, the man who invented sliced bread, filed a patent for his bread slicing machine. Fact 24: Who invented Bread? There are many different types of breads available. Yeast breads include Anadama, a US cornmeal and molasses based sweet tasting bread. The bagel, the French baguette, the Irish Barmbrack, the Italian Bastone and Focaccia, the French Boule, Fougasse and Brioche, the Polish Bialy and the English Cottage loaf. Fact 25: Who invented Bread? Famous flatbreads include the Jamaican Bammy, the Scottish Bannock, the US Johnnycake, the Jewish Matzo, the Asian Naan breads, the Indian Papadum and Roti, the Italian Piadina, Pita and Pizza and the Mexican Tortilla. Fact 26: Who invented Bread? Garlic bread originated in Italy and features a topping of garlic in butter or olive oil. Raisins had been added to breads by the Greeks and the Romans but it was Henry David Thoreau of Concord, Massachusetts who made Raison Bread popular. Fairy bread, a soft white treat spread with sweet butter and topped with brightly colored sprinkles originated in Australia. Tiger bread is made with sesame oil and has a unique mottled crust, is thought to have originated in Italy.